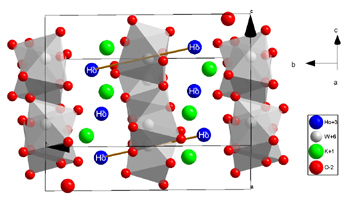 Well oriented KHo(WO4)2 single crystal has been investigated by means of very sensitive EPR technique. Low temperature EPR spectra collected at three perpendicular planes of the crystal rotation allowed to find out information about the nature and local symmetry of detected magnetic centers. g matrix has been calculated, including its principal values as well as space orientation. As trivalent holmium ions are expected to be EPR silent, observed signal is attributed to different type of complex holmium magnetic systems, arranged with help of some defects like vacancies of W6+ ions.